Kalanchoe spp. : Final test casting. About five inches tall with bronze base. Pleiospilos nelii: Final test casting. About four inches tall with bronze base. 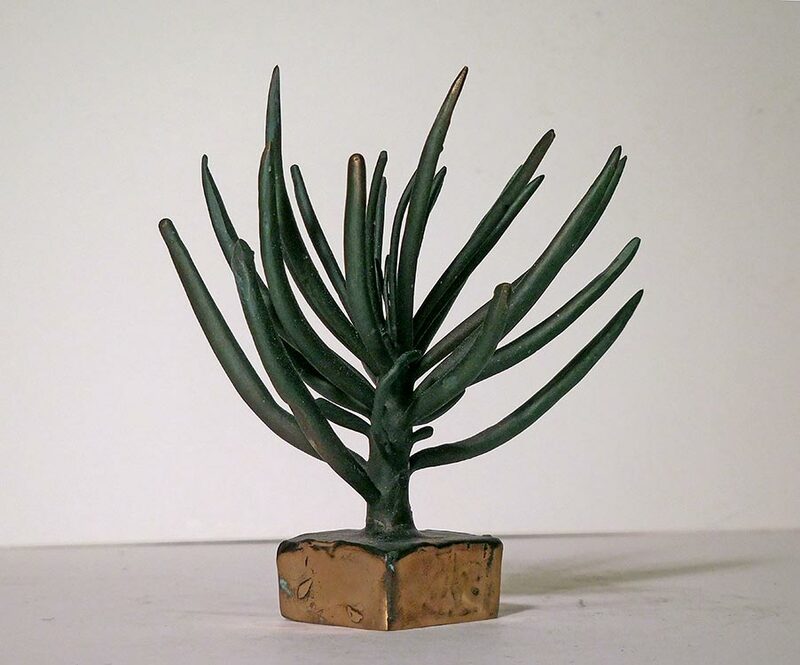 Aloe zanzibarica: Final test casting. About five inches tall with bronze base. 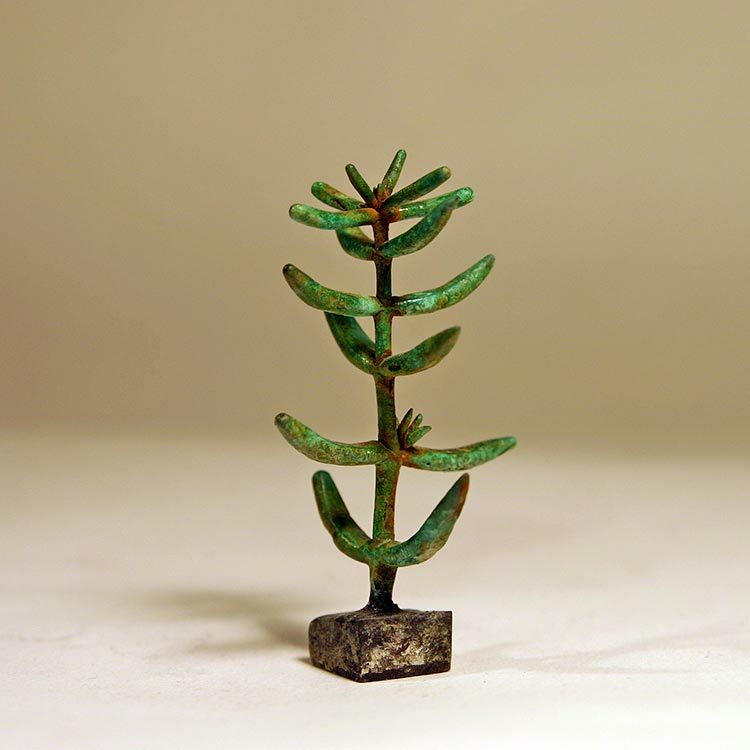 Crassula teragona: Final test casting. 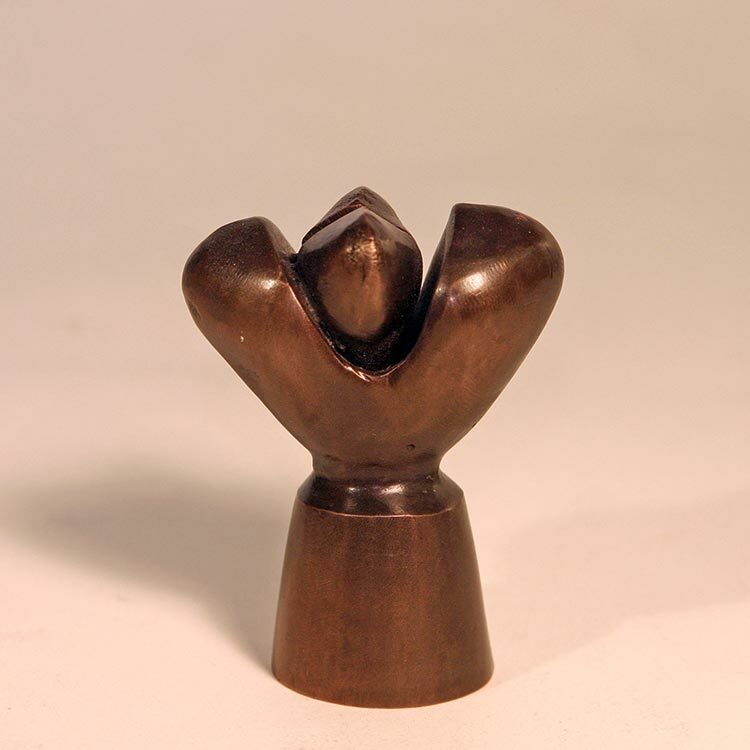 About six inches tall with bronze base. 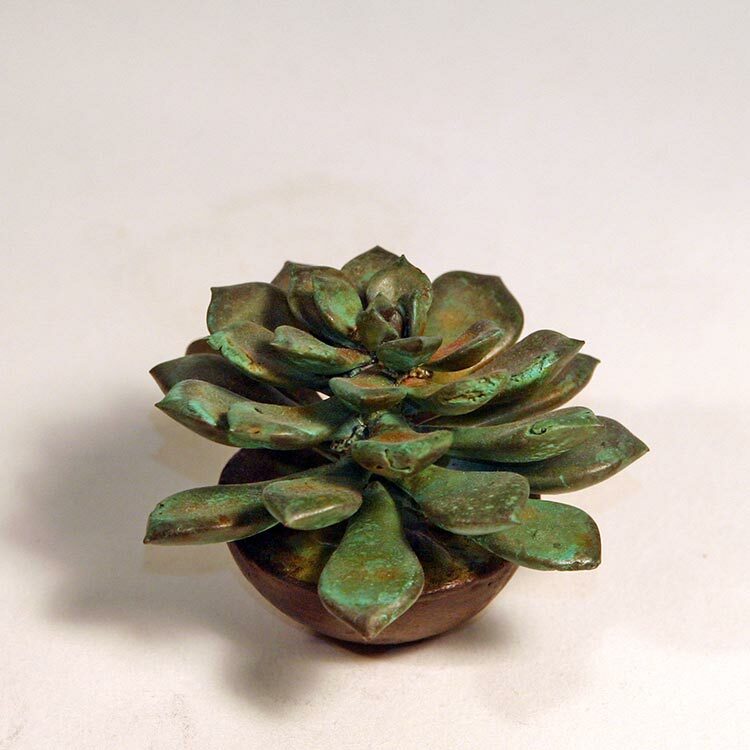 Echeveria Hybrid: Final test casting. About three inches tall with bronze base. 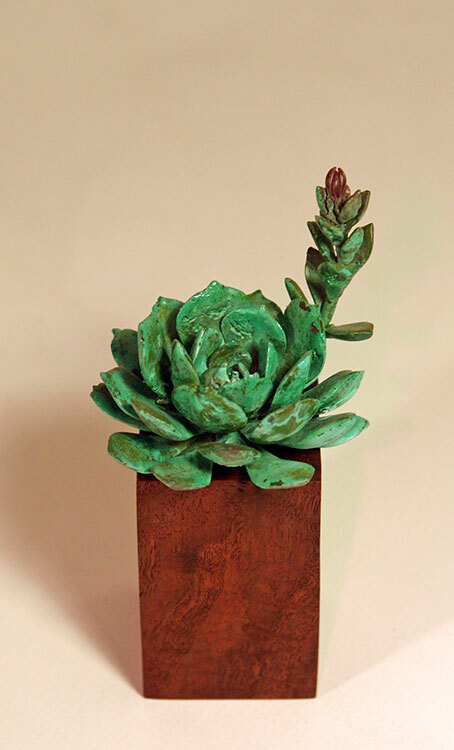 Echeveria Hybrid: Final test casting. About four inches tall without walnut base. Kalanchoe spp. : Final test casting. About four inches tall with bronze base. Pachyveria ‘Belle Blue’: Final test casting. 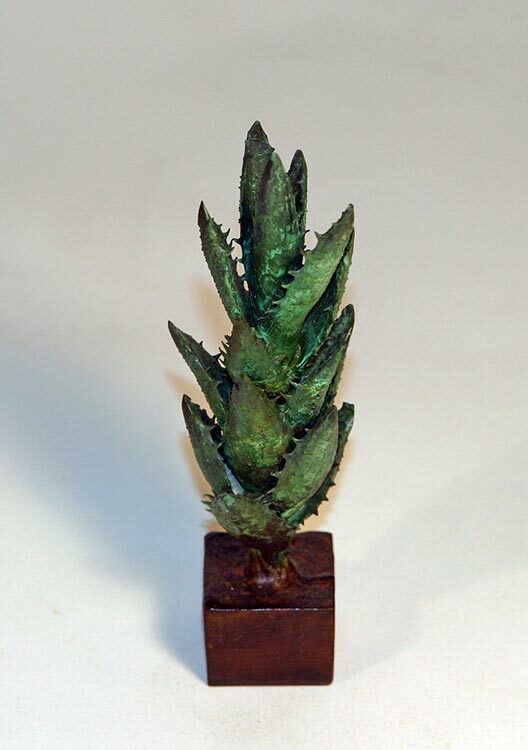 About seven inches tall with bronze base. 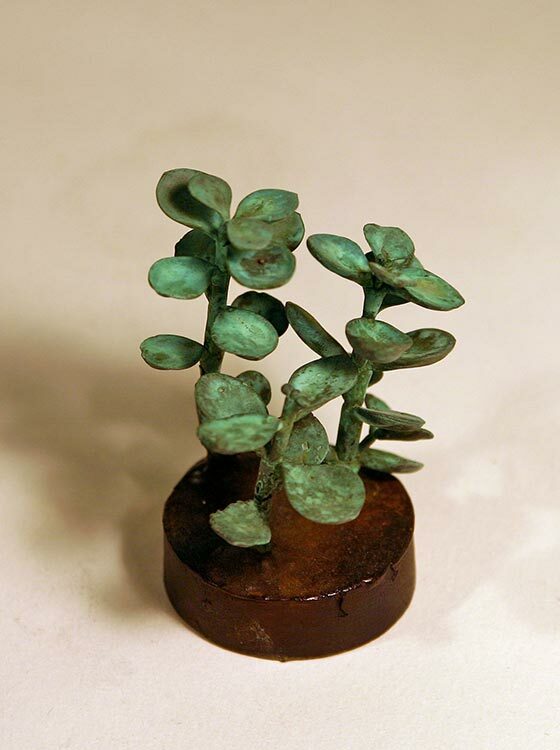 Portulacaria afra: Final test casting. About four inches tall with bronze base. 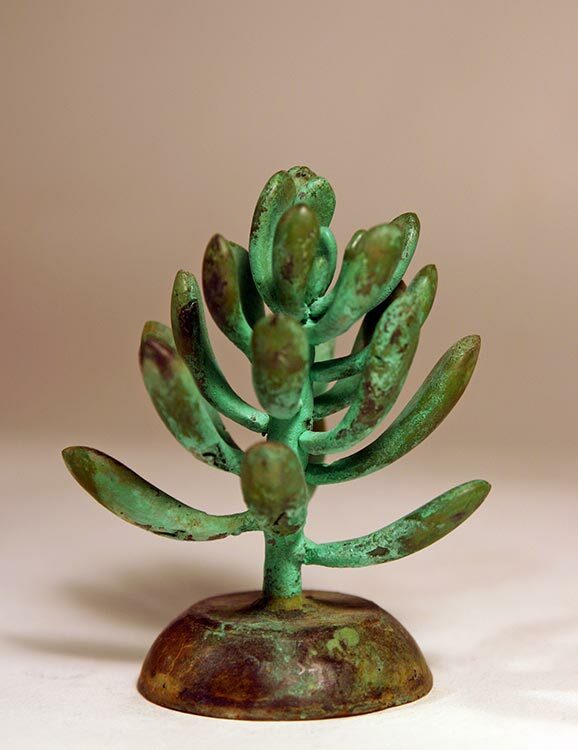 Senecio vitalis: Final test casting. About five inches tall with bronze base. Phalaenopsis: Two flowers cast with a centrifuge. Processes were evolving to combine ceramic shell and centrifuge to get more delicate structures. 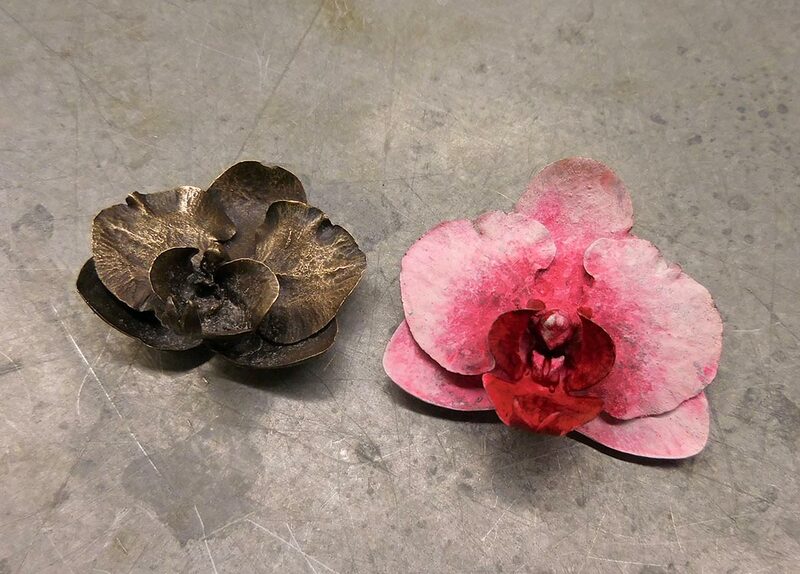 Flower on right has painted patina. Group of final castings after the patina process. 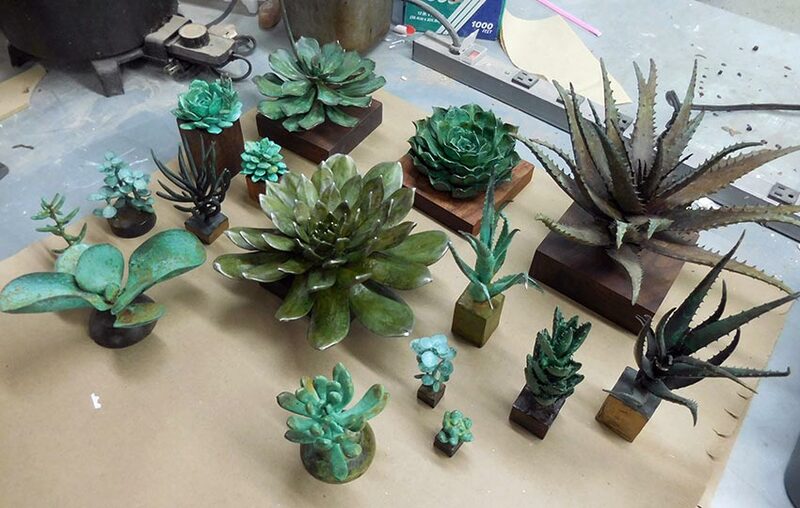 Throughout the process of casting larger succulents, I completed a variety of tests on alternate species. Results were varied as many of the castings had shrinkage issues inside of the ceramic casting molds. Delicate stems and connections between leaves and the stem were the most likely areas for failure. Over time, I developed a spectrum to assess the likely success of casting based on the ability to burnout the organic material and the plant structure. 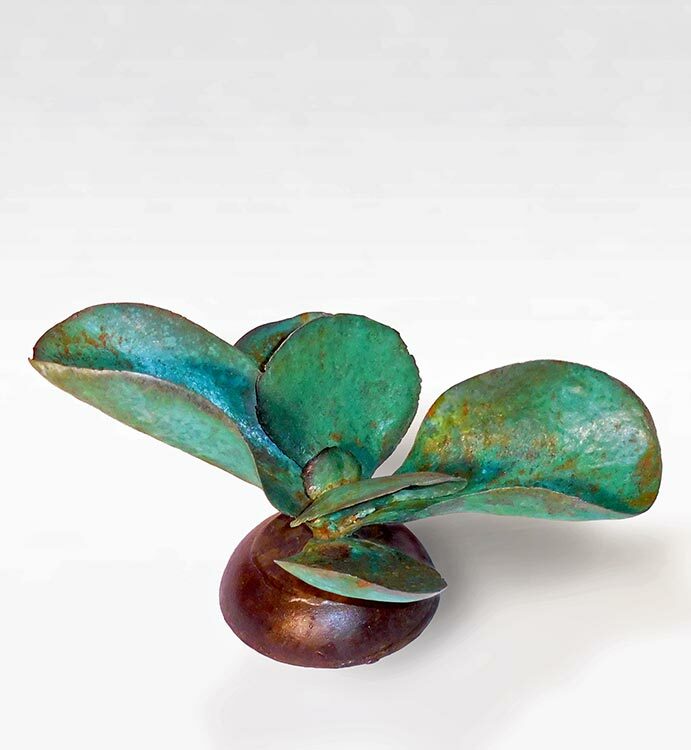 Towards the end of the experimentation, I began to work with a casting centrifuge that allowed me to create delicate flowers with a high level of success. Unfortunately, due to the size of the equipment, larger pieces and flowers were not possible. 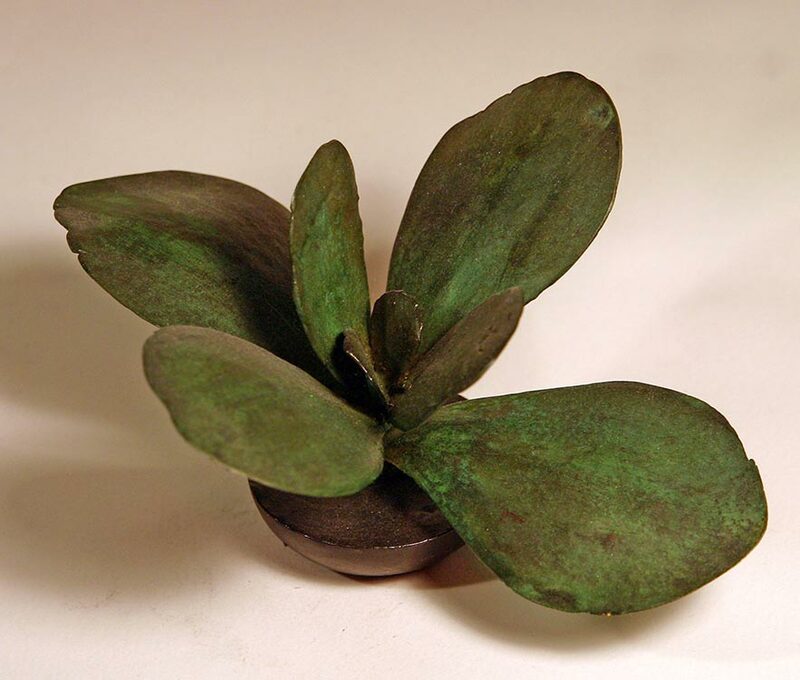 However, there were early successes casting the body of Phalaenopsis orchids with ceramic casting, the flowers in the centrifuge, and then welding the pieces together.